London Graving Dock Co. Ltd. B.A., A.C.A., to the board as Group financial director. Gravesend. Mr. Sidgwick joined the L.G.D. in 1935, a'nd has held various senior managerial positions within the Group. He has recently been responsible for a complete rationalization and reorganization of the activities of the ship repairing divisions. Mr. Davie's responsibilities will include the control and coordination of all the financial and accounting divisions of the seven member com- panies within the Group. Room of the Spanish Industry Institute (I.N.I. ), Madrid, to authorize the board-of di- rectors to increase the capital stock of the com- pany by 50 percent during the next few years. The invoicing of the. companies which are 100 percent within the Astilleros Group repre- sents 29,250 million pesetas. Astilleros Espanoles, S.A. delivered 1,420,000- deadweight tons in 1973, an 11 percent increase as compared with deliveries over the last fiscal year. The type of vessels were 230,000-dwt, 110,- 000-dwt and $3>5,000-dwt tankers ; 53,000-dwt, 35,000-dwt and 27,000-dwt bulkcarriers, and 19,000-dwt cargoliners. These include the tank- ers for Iraq. Spain now ranks fourth in shipbuilding and moves ahead of such traditional shipbuilding nations as France, England, Norway, Denmark and Italy. Astilleros Espanoles, S.A. is the builder of 60 percent of Spanish newbuildings. The order- book shows 92 vessels with' 7,700,000 dead- weight tons. Astilleros Espanoles, S.A. to increase produc- tion. The concerted action program will be com- pleted in 1974. The construction of a large dock in the new repairing center in the Bay of Cadiz continues as anticipated and will foe in operation at the end of this year. 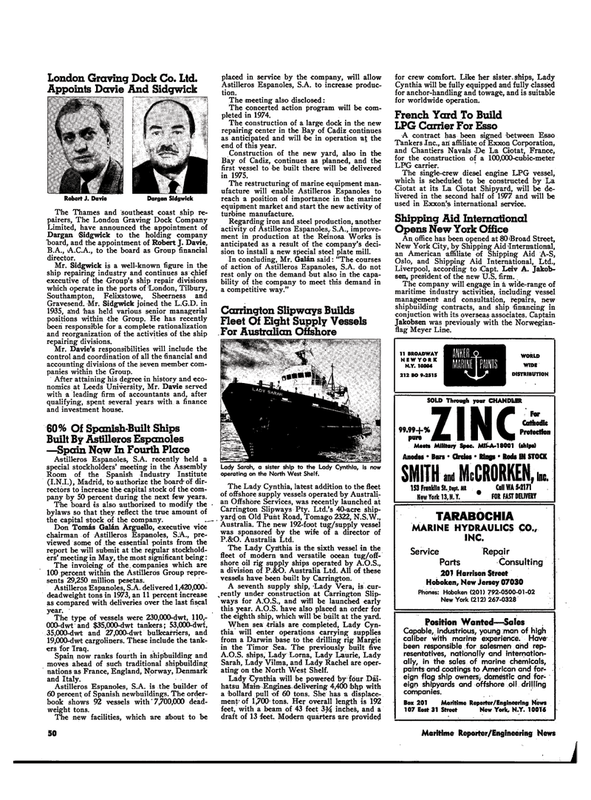 Bay of Cadiz, continues as planned, and the first vessel to fee built there will be delivered in 1975. The restructuring of marine equipment man- ufacture will enable Astilleros Espanoles to reach a position of importance in the marine equipment market and start the new activity of turbine manufacture. Regarding iron and steel production, another activity of Astilleros Espanoles, S.A., improve- ment in production at the Reinosa Works is anticipated as a result of the company's deci- sion to install a new special steel plate mill. In concluding, Mr. Galan said: "The courses of action of Astilleros Espanoles, S.A. do not rest only on the demand but also in the capa- bility of the company to meet this demand in a competitive way." Lady Sarah, a sister ship to the Lady Cynthia, is now operating on the North West Shelf. The Lady Cyrithia is the sixth vessel in the fleet of modern and versatile ocean tug/off- shore oil rig supply ships operated by A.O.S., a division of P.&O. Australia Ltd. All of these vessels have been built by Carrington. A seventh supply ship, Lady Vera, is cur- rently under construction at Carrington Slip- ways for A.O.S., and willl be launched early this year. A.O.S. have also placed an order for the eighth ship, which will be built at the yard. Sarah, Lady Vilma, and Lady Rachel are oper- ating on the North West Shelf. Cynthia will be fully equipped and fully classed for anchor-handling and towage, and is suitable for worldwide operation. Ciotat at its La Ciotat Shipyard, will be de- livered in the second half of 1977 and will be used in Exxon's international service. Liverpool, according to iCapt. Leiv A. Jakob- sen, president of the new U.S. firm. New York 13, N. Y. Capable, industrious, young man of high caliber with marine experience. Have been responsible for salesmen and rep- resentatives, nationally and internation- ally, in the sales of marine chemicals, paints and coatings to American and for- eign flag ship owners, domestic and for- eign shipyards and offshore oil drilling companies.